Oh wait – wrong (classic) TV show. 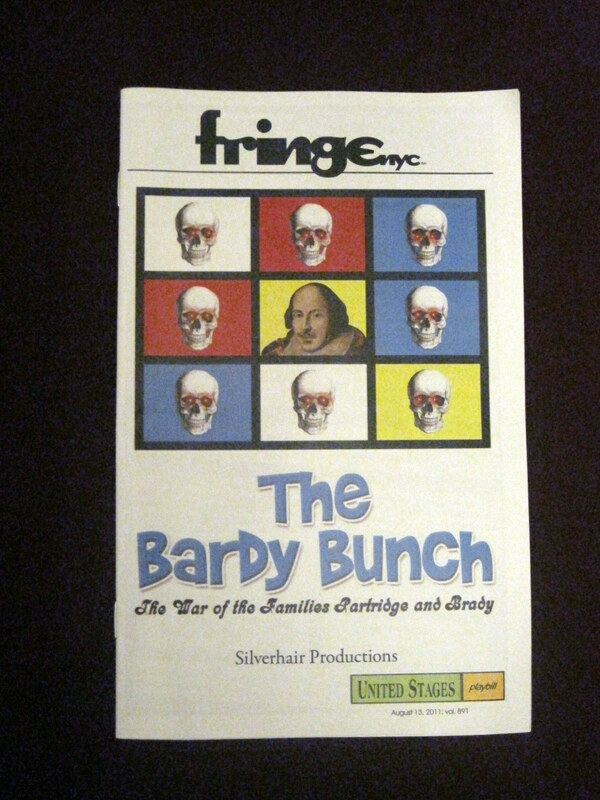 As mentioned in previous blog posts, I’ve been a fan of The Bardy Bunch: The War of the Families Partridge and Brady, written by Stephen Garvey, since I saw the production four years ago in the Ellen Stewart Theatre at La MaMa (located downtown in the East Village), during the New York International Fringe Festival. 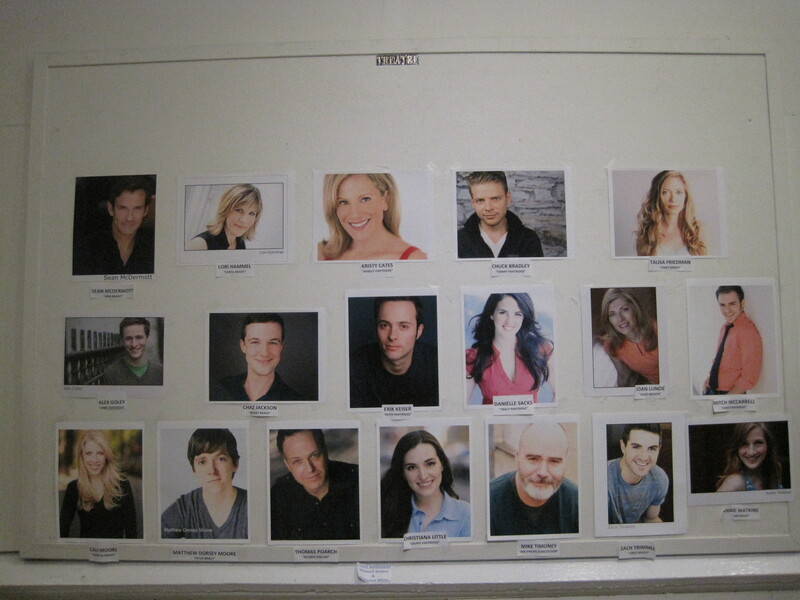 Since then, the show has undergone some (minor) script changes as it continues its trek uptown, having most recently played at the Theatre at St. Clement’s (located on 46th Street between 9th and 10th Avenue) last spring. The latest stop on its (hopefully inevitable) journey to the Great White Way reached 54 Below (located at 54th Street between 7th and 8th Avenue), where musical theatre performers perform intimate cabaret shows. The performance I attended was an encore presentation (the first show happened a month prior), and was more of a mini-concert than excerpts from the stage production. 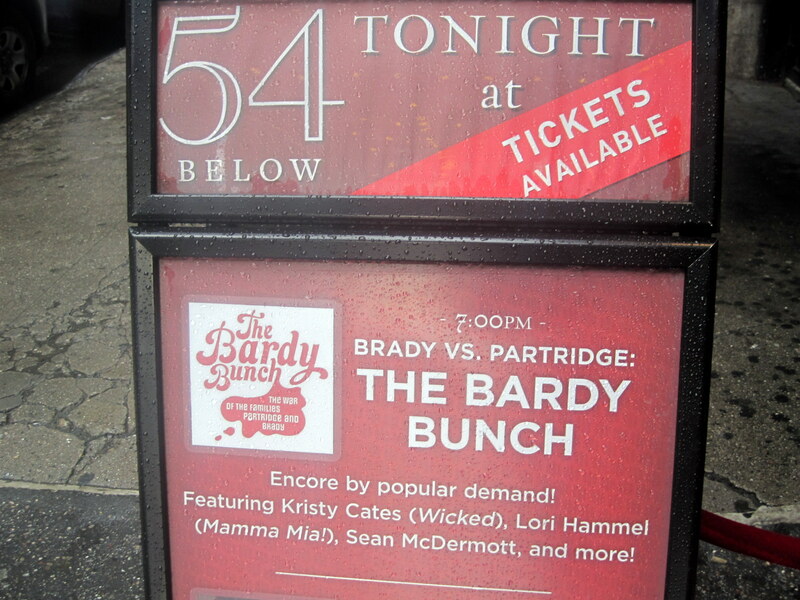 Yet the overall premise was similar: the Bradys and Partridges crossed paths due to an inadvertent double booking and took turns to win over the audience. 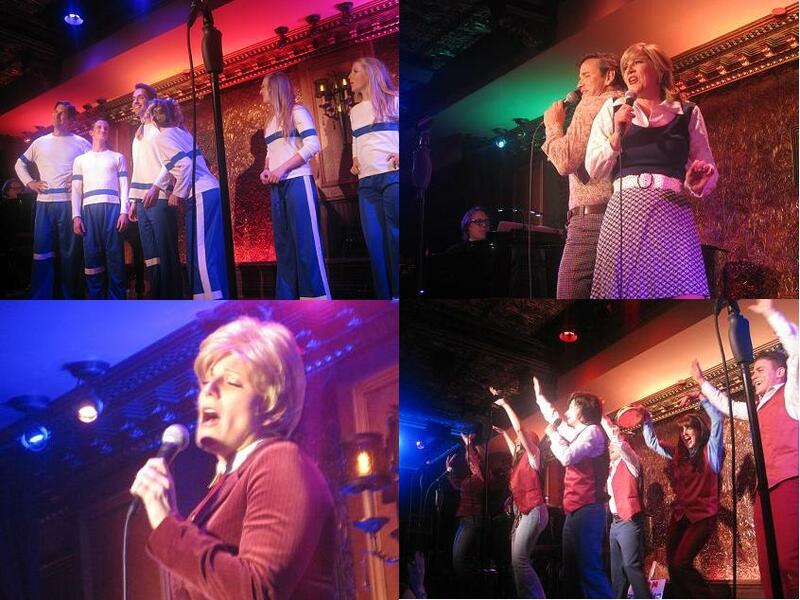 Several of the iconic songs from The Brady Bunch and The Partridge Family were sung, along with other notable ‘70s songs – fitting given the reputation of the venue. Some of the Shakespearean elements from the stage production were sprinkled throughout. Many of the cast remained the same from previous incarnations, and expertly used the intimacy of the venue to their advantage, weaving between the tables and interacting with the audience to their great amusement. For more information about The Bardy Bunch: The War of the Families Partridge and Brady, please visit their website: thebardybunch.com. Everything old is new again, or at least it seems that way – these days, most of the TV shows, movies and musicals mine their source material from the past – remakes or “reboots”, with varying degrees of (financial and critical) success; another consistent trend is to reinterpret various Shakespearean plays and set them in modern-day (well, comparatively modern). 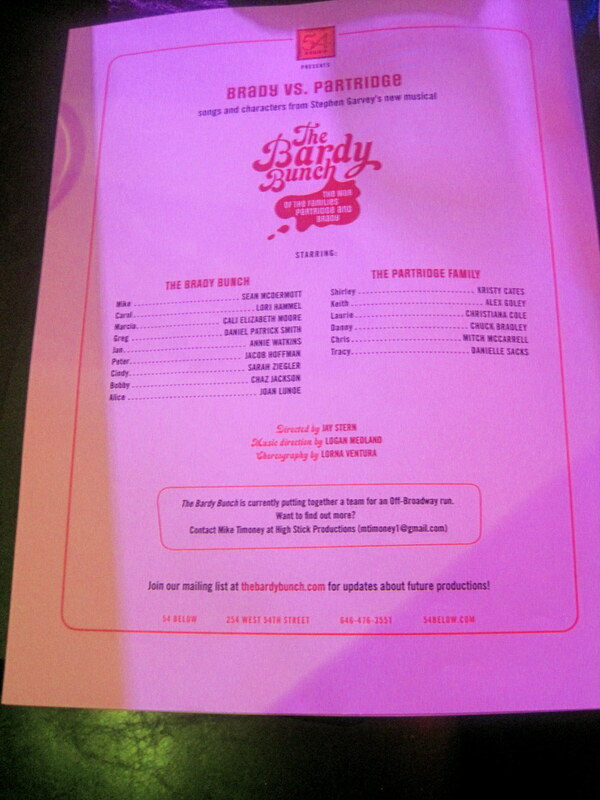 The Bardy Bunch: The War of the Families Partridge and Brady, written by Stephen Garvey, uses these two well established methods of storytelling and mashes them together, and the end result is a hilarious and inspired production that will please fans of The Brady Bunch and The Partridge Family as well as devotees of Shakespeare of all varieties. 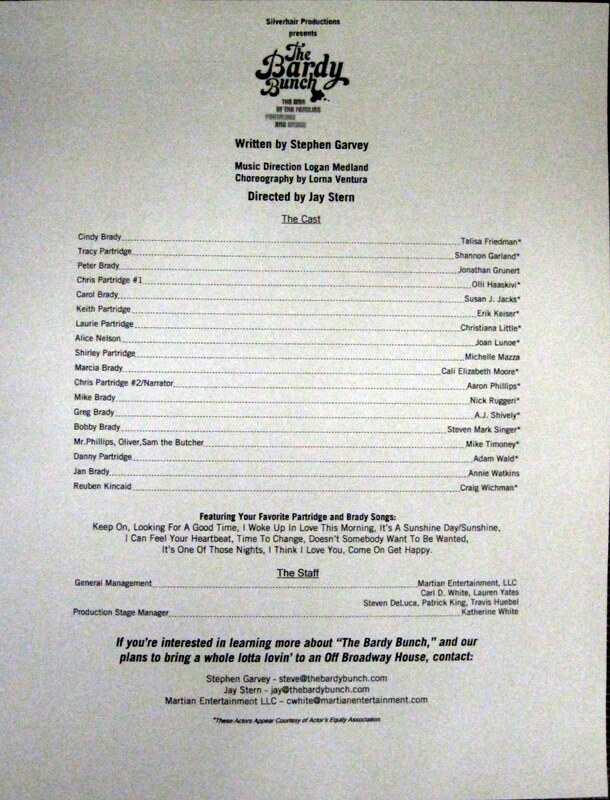 The cast was astounding, many of whom reprised their respective roles from the initial production and continue to shine (among those were Erik Keiser as Keith Partridge, Annie Watkins as Jan Brady, and Cali Elizabeth Moore as Marcia Brady) as well as newcomers who brought their interpretation to their respective roles (among those were Sean McDermott as Mike Brady and Zach Trimmer as Greg Brady). Each actor captured their respective character’s trademark tics and catchphrases with ease, to the amusement of the audience, recognizing something familiar from their upbringing (or in my case, from frequent reruns on TV). In that previous blog (written almost a year ago), I had stated that I hoped this show would find an off-Broadway venue in the near future, and considering the Theater at Saint Clement’s is located on 9th Avenue and 46th Street, technically speaking, this run was off-Broadway (albeit for a limited run). Hopefully, word of mouth from its nightly sold out performance will garner the attention of Broadway producers (or perhaps non-profit theater organizations) and lead The Bardy Bunch a few avenues east to Broadway. The Bardy Bunch: The War of the Families Partridge and Brady is a new musical written by Stephen Garvey that cleverly combines characters from The Brady Bunch and The Partridge Family with elements from about a dozen or so Shakespeare plays, most prominently Romeo and Juliet, Hamlet, Macbeth and Much Ado About Nothing. 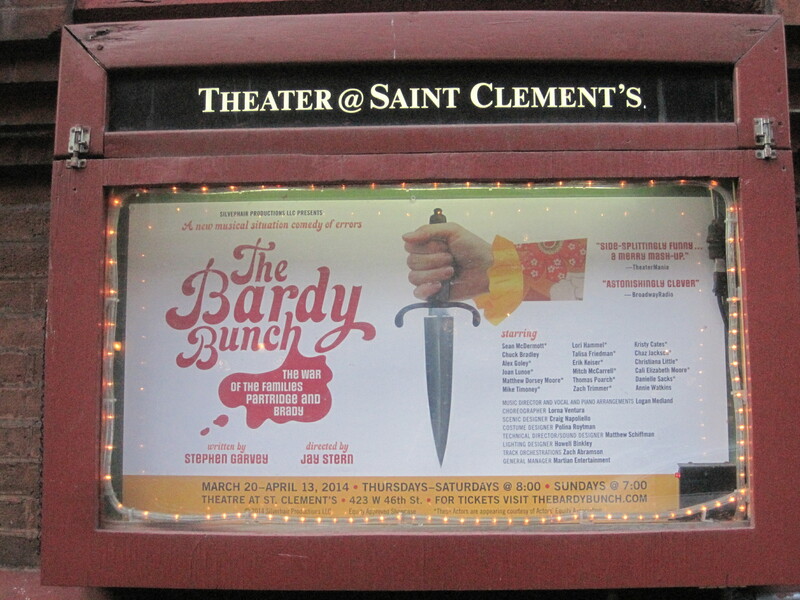 As with many of Shakespeare’s plays, The Bardy Bunch has moments of drama, comedy, and tragedy, coupled with a smattering of familiar tunes from both The Brady Bunch and The Partridge Family, including “I Think I Love You”, “Time To Change”, “It’s Sunshine Day” and “Come On Get Happy”. My first encounter with this show was nearly two summers ago when I saw the full production at the Ellen Stewart Theatre at La Mama, one of the shows featured at the New York International Fringe Festival. 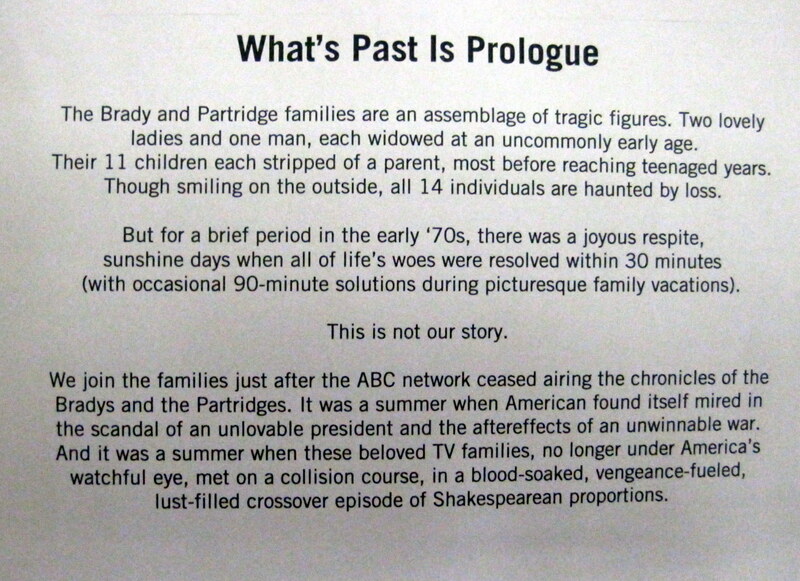 I’ve always had an interest in Shakespeare’s plays, and variations thereof, and the premise of essentially a long crossover episode involving the main characters from The Brady Bunch and The Partridge Family, blended with a smattering of the Bard’s most famous plays was an ingenious one, of which I was fairly surprised no one had thought of doing before. 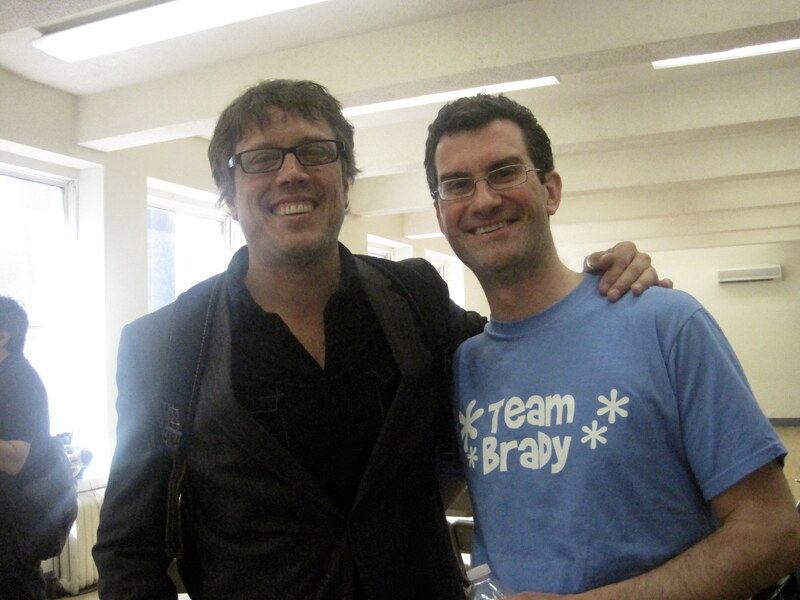 Also, for the sake of full disclosure, another [added] reason for my interest in seeing this show was the fact that A.J. Shively, whom I had seen numerous times in La Cage aux Folles, was among the cast (as Greg Brady). The show was hilarious in utilizing easily recognizable catchphrases and references to both television programs, intertwining them with Shakespeare’s verse. The cast was spot on in their respective roles, and truly looked as if they were having a marvelous time; the performances skillfully avoided parodying the actors who had originally portrayed the characters on TV. Notable standouts were Erik Keiser as Keith Partridge, Annie Watkins as Jan Brady, and Cali Elizabeth Moore as Marcia Brady. I was fortunate enough to attend a special presentation at Pearl Studios on May 16th, albeit a reduced version of the show (running about 90 minutes with out an intermission) with minimal costumes. There had been an initial presentation shortly after the run at the Fringe, a full production at the Kraine Theater; on both occasions, investors (as well as fans of the show) had been invited to see the presentation – I fell into the latter category, though had I had the financial means to do, I would have invested in the show. As it was a shortened version of the show, a narrator was included to fill in the bits that were taken out, and to provide exposition for the story. Also as an unintentional and classic nod to the series, on the day I attended the presentation (there was another the next day) it was explained by director Jay Stern that Adam Wald, the actor portraying Danny Partridge, had recently developed laryngitis and would not be able to recite the lines, and that writer Stephen Garvey would be reciting the lines (which added another level of hilarity to the presentation.). Even as a reduced version of the show, it was witty and highly entertaining, and the majority of the cast from the Fringe Festival reprised their roles, (except for two, who had since moved out of New York), which is a testament to the quality of the show. The goal of the show is to find an off-Broadway venue, a goal I sincerely wish the creative team achieve some time in the near future and hopefully after that perhaps a transfer to a Broadway theater. 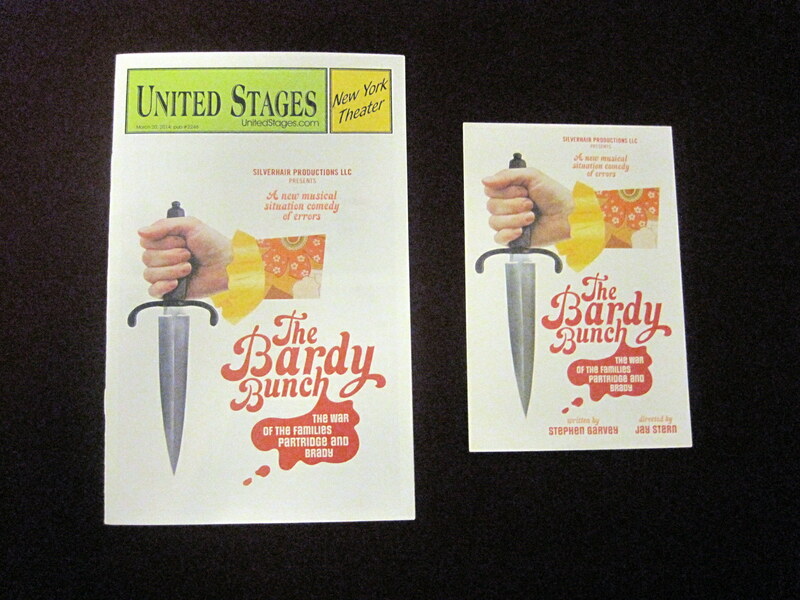 The Bardy Bunch: The War of the Families Partridge and Brady is a fun show that appeals to fans of The Brady Bunch and/or The Partridge Family, as well as for fans of Shakespeare pastiches.